When the 2D Castlevanias achieve near unanimous rave reviews it’s a wonder that they keep pursuing that losing battle of trying to make a decent 3D iteration of the series, and this keeps up the trend by being probably the best new entry to the series since Symphony of the Night on the PS1. 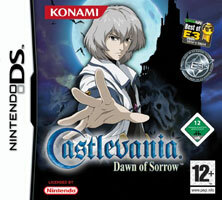 Konami deserve credit for just picking up from their good work on the excellent GBA Castlevanias (they even carry on with the new protagonist, Soma Cruz, introduced in Aria of Sorrow) and, on the whole, resisting the urge to shoehorn in functionality based on the unique functionality of the DS. There are some touch screen functions that work like the breakable blocks and some that don’t like the annoying seal-drawing to deliver the final blow to bosses, but most of the additions use the extra power to make some cool cosmetic touches and, naturally, some bigger and more impressive enemies. Castlevania games are reliable for being lengthy and addictive action adventures, and this is one of the best in a long time. It therefore happily sits in my best of the year.